Extensive wind tunnel tests and numerical flow calculations were used to develop and optimize an ultra-lightweight slow speed vertical small wind turbine system, using the highest possible levels of efficiency and based on the Savonius rotor. For months, we developed, calculated and optimized this innovative rotor form which enables a higher yield of the oncoming wind. The new wind turbine follows the classic Savonius idea, but has a new innovative rotor geometry, which thanks to an intelligent flow design, avoids pressure differences, outages and turbulence. The wind turbine Wind of Change with its characteristic helical shape has an increase in output of more than 28 percent in complex 3D aerospace engineering flow analysis tests, when compared with conventional vertical resistance runners. Ultra-lightweight rotor made from modern high-performance composites, consisting of two horizontal lens discs, attached to a vertical rotor axis, between which two or more semicircular curved blades are vertically mounted. The blades are arranged offset from one another, so that a part of the wind is diverted from the right and left openings to the scooped sides of the blades and can therefore act on the reverse side of one of the concave blades. The action is based both on aerodynamic lift as well as resistance induced tunneling. 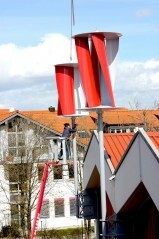 A vertical axis turbine (VAWT: Vertical Axis Wind Turbine) functions regardless of the wind direction. The spiral structure of the helix design ensures that even during turbulence, the wind can have an effect on every part of the surface area. The shape of the helix was inspired by nature (Bionics) and resembles the human DNA structure. 210 to 280 Watts of electrical power can be generated per square meter of windswept rotor surface area. In umfangreichen Windkanalversuchen und numerischen Strömungsberechnungen wurde eine vertikale Kleinwindenergieanlage (Langsamläufer) in Ultra-Leichtbauweise mit höchstmöglichen Wirkungsgraden auf der Basis des bekannten Savonius-Rotors weiterentwickelt und optimiert. Wir entwickelten, berechneten und optimierten über Monate hinweg diese innovative Rotorform, die eine höhere Ausbeute des heranströmenden Windes ermöglicht. Die neue Windturbine folgt zwar der klassischen Savonius-Idee, verfügt aber über eine innovative Rotorgeometrie, der dank intelligenter Strömungsführung störende Druckdifferenzen, Strömungsabrisse und Verwirbelungen vermeidet. Die Windturbine Wind of Change mit ihrer charakteristischen Helixform hat in komplexen 3D-Strömungsanalysen aus der Luft- und Raumfahrttechnik eine Leistungssteigerung von mehr als 28 Prozent gegenüber konventionellen vertikalen Widerstandsläufern nachgewiesen. Ultra-Leichtbau-Rotor aus modernen Hochleistungsverbundwerkstoffen, bestehend aus zwei an einer vertikalen Rotorachse angebrachten waagerechten Linsenscheiben, zwischen denen zwei oder mehr halbkreisförmige gebogene Schaufeln senkrecht stehend montiert sind. Statische Berechnungen und Nachweise für Anbindungen an bestehende Gebäude werden von INSTAL Engnineering durchgeführt.